Thames Discovery Programme - TDP and Tadpoles! 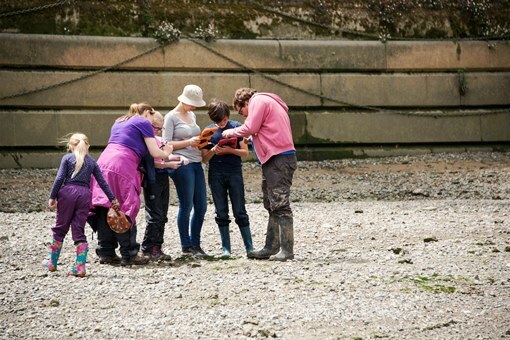 Last week the Thames Discovery Programme, with support from Tideway, ran three sessions for the Tadpoles, the new group of young foreshore archaeology enthusiasts. 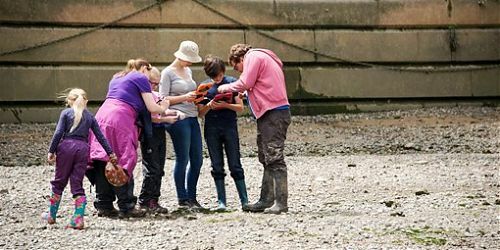 The sessions in Putney allowed our young audience to get to grips with two different methods of recording the archaeology of the foreshore – one analogue and one digital. We began each activity on the stretch of foreshore between Putney Bridge and Fulham Railway Bridge. In the past this area has provided evidence of Anglo-Saxon fishtraps, the remains of the first Putney Bridge built in 1729 and evidence of river access in the form of a causeway so it was a great site for the Tadpoles to test out some technology. The first session focused on using drawing as a way of recording. The group used as their model a map drawn by the late Ivor Noel Hume, a pioneer of foreshore archaeology. The map shows the types of features and artefacts found on the Southwark foreshore, which helped us position ourselves with the key landmarks in our area, the slipway, St Mary’s Church and Putney Bridge. Whilst walking the foreshore, we talked about the differences between features and artefacts and how both help archaeologists to better understand a site. Using their new skills, the Tadpoles then set about recording some of the important features along the Putney foreshore, including the remains of the footings of Putney’s first bridge. Our second day on the foreshore coincided with London History Day which saw the Tadpoles take to the foreshore once again and get to grips with a far more modern way of recording the archaeology on the foreshore, by using the CITiZAN app to record what they found. Developed for recording coastal archaeology, the Tadpoles were able to use the app to update records on previously recorded features and also have a go at recording their own discoveries. Ranging from a traffic cone to a metal pipe to the remains of a wooden drain, the things they discovered helped them to understand the vast range of features and objects that can be found on the foreshore. It also allowed them to consider what should and should not be recorded. The Thames Discovery Programme will be hosting two more exciting Tadpoles sessions in the first week of the summer holidays in Deptford; thanks to funding from Tideway, these events are FREE and all the details are here.